How digital thermostat to use? Note for P2 and P3: These are the limits that you set in the administration of the thermostat housing (long press the SET button). When a short press of the SET button then you can adjust the temperature only in the range of P2 - P3. Poznámka pro P2 a P3: Jedná se o limity, které nastavíte v administraci termostatu (dlouhé podržení tlačítka SET). Při krátkém stisknutí tlačítka SET pak můžete nastavit teplotu pouze v rozsahu P2 - P3. 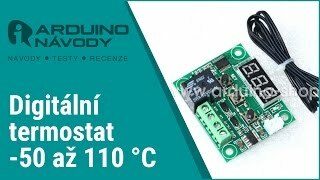 The packaging for the Module digiálního temperature controller W1209, material: acrylic. 2,86 € tax incl. 2,36 € tax excl.